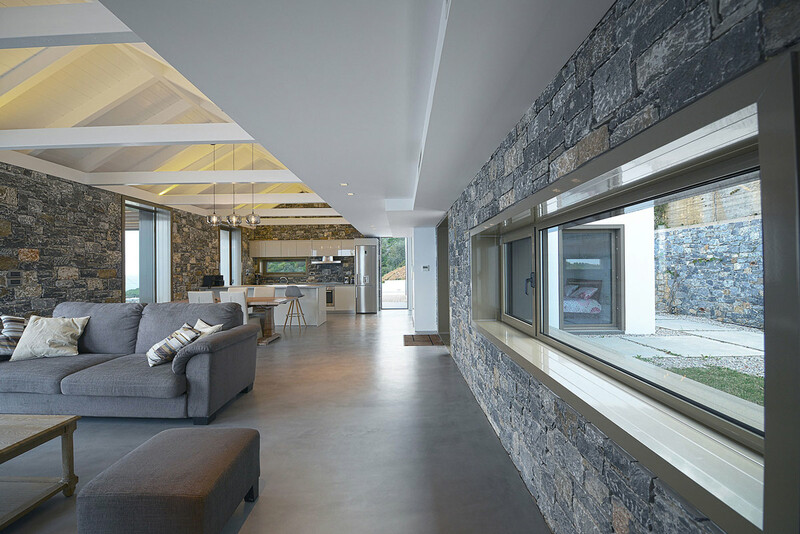 Villa Melana was completed by Valia Foufa & Panagiotis Papassotiriou studios. 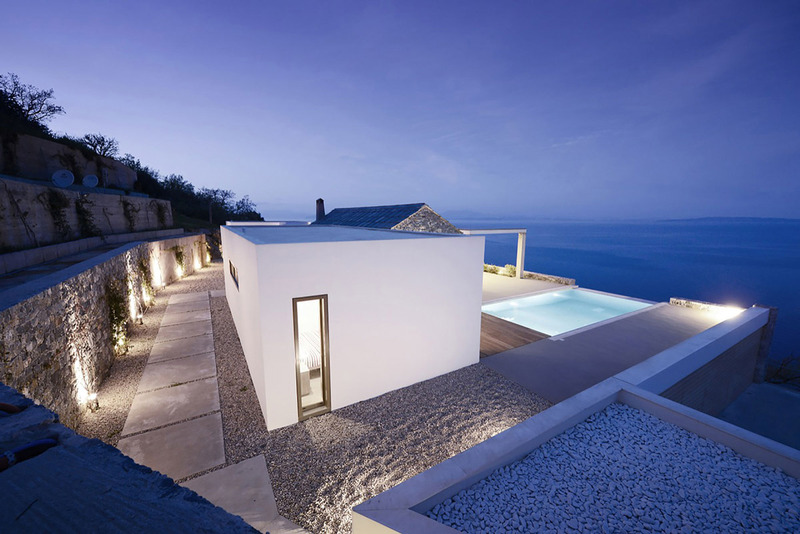 This fabulous clifftop home has been designed for a family from Athens as a seaside holiday retreat. 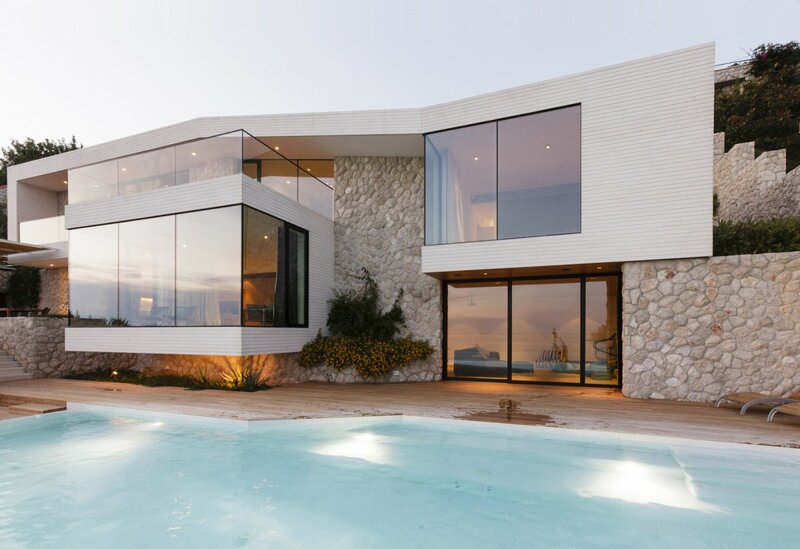 The house is split into three volumes, floor-to-ceiling glass maximizes the sea views. 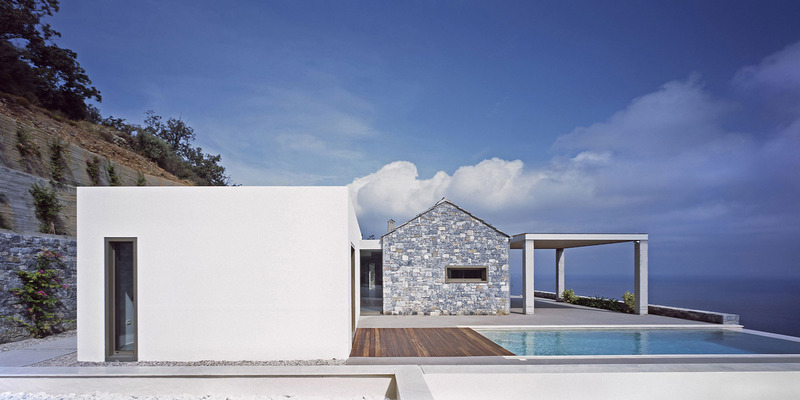 Villa Melana is located in Pera Melana, Greece. 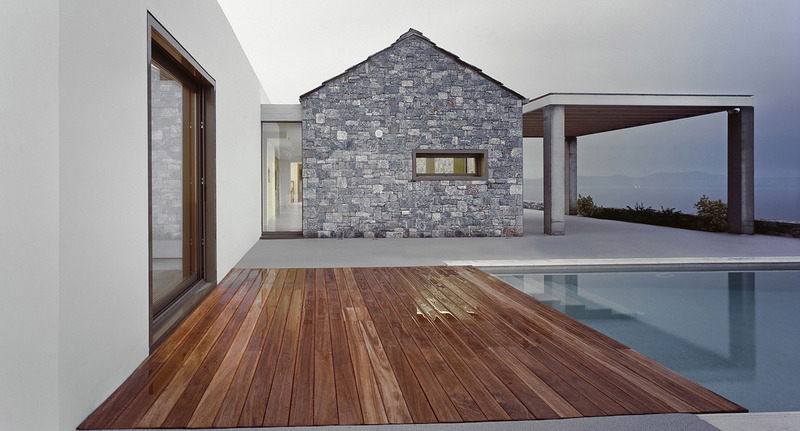 “The project was awarded to us by a family living in Athens keen on a new country house in the Arcadian Landscape. 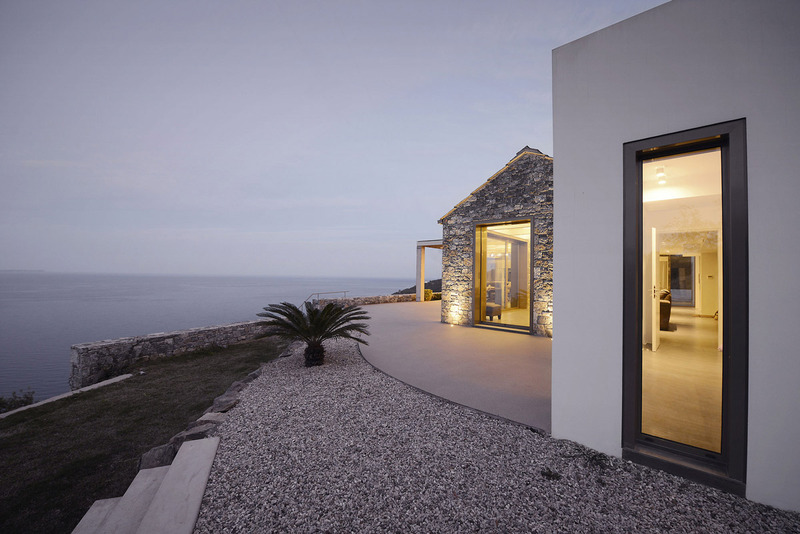 Design started mid-2012 and work on site was completed at the end of 2014. 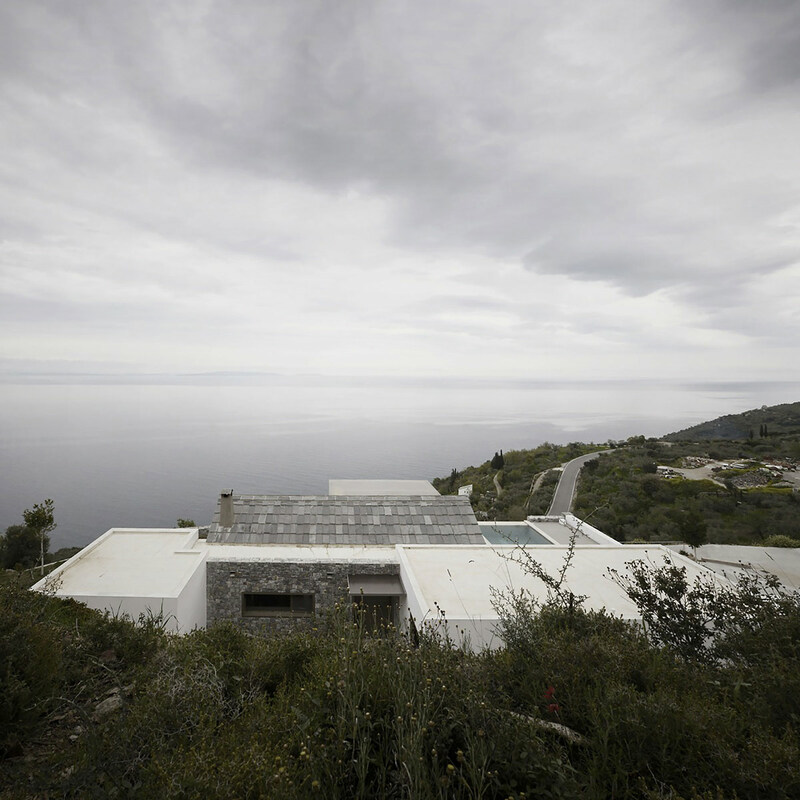 It all started as a simple snapshot; At a very steep site with clear view towards the sea a holiday retreat protects its inhabitants from the sun heat and the strong winds while soothing the senses under the moonlight. We have placed the building at the only available naturally formed plateau of the site in order to avoid unnecessary groundworks that could spoil the relief. Simple elements to deal with a difficult and very unstable and steep terrain. The endless of the sea view and the enormity of the open horizon is overwhelming and therefore no great attempt is needed to frame the views. 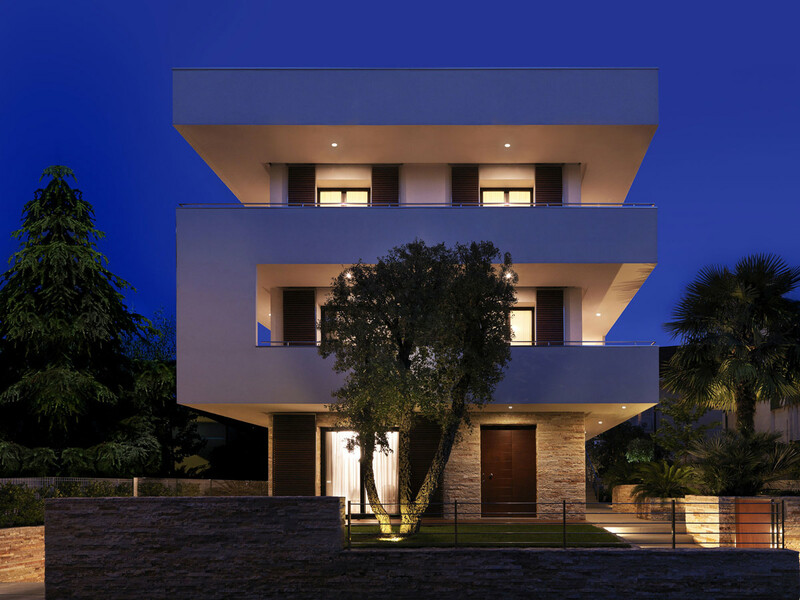 The structure is defined by 3 volumes that are placed along the contour lines. The end product is a result of the division of a rectangular volume into 3 parts while staggering the middle part towards the east. 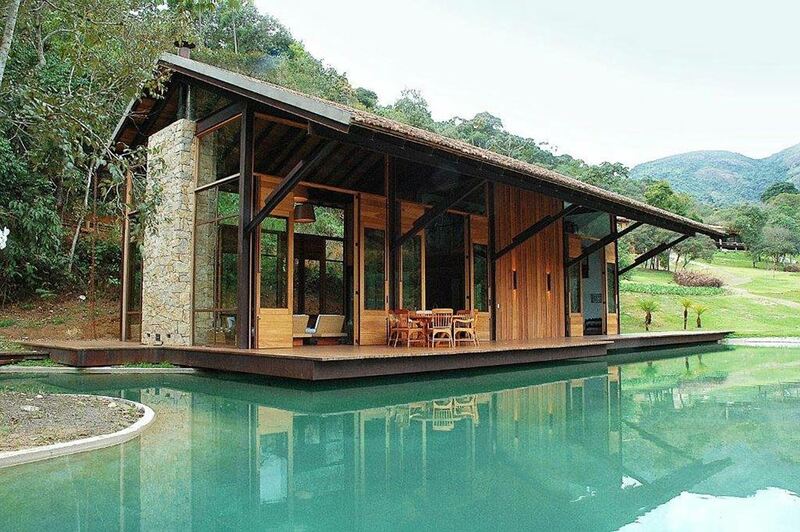 This break is enhanced by the use of various materials and alteration of the design. 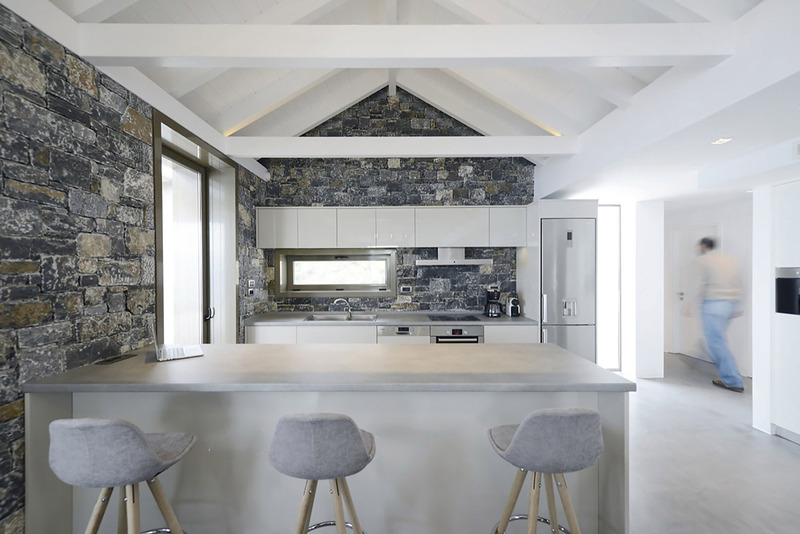 The main features of the central volume (where the day activities are hosted) are the cladding with local Arcadian stone – dry stone construction both internally and externally on concrete frame and brick infill -, pitched gabled roof with roof slates and the fireplace on the narrow end framing the view. 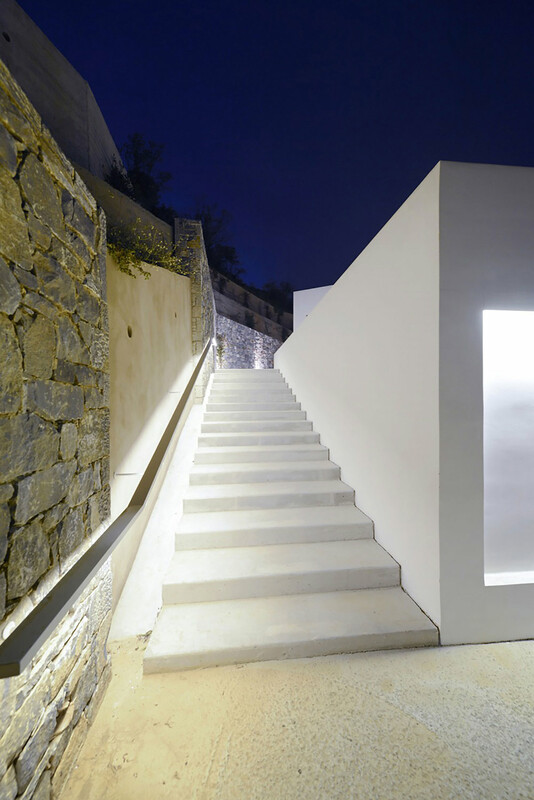 The design has references to the local architecture (where the Tsakonian “Makrinaria” are met) incorporating changes to the form and size of the openings in order to achieve better results on the bioclimatic output and view. 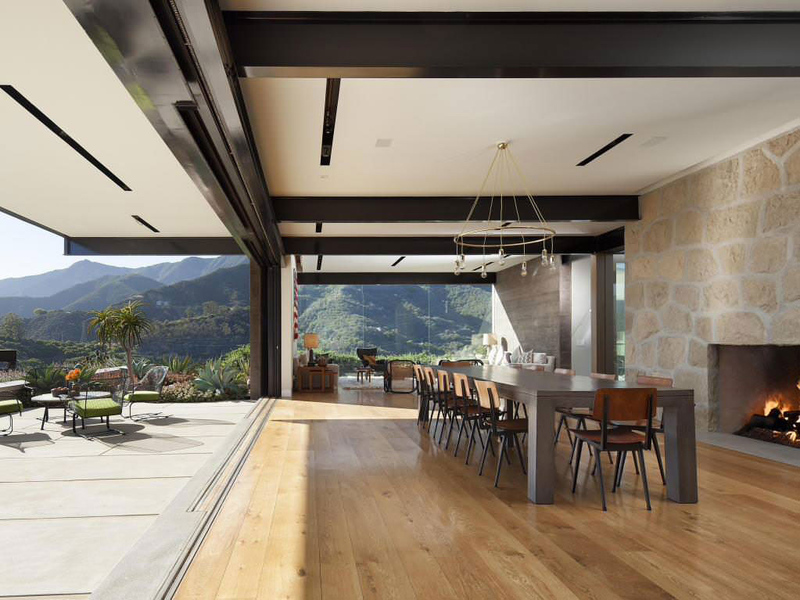 Floor to ceiling openings enhance the dual aspect feature without affecting the monolithic quality while the views cross on all sides. 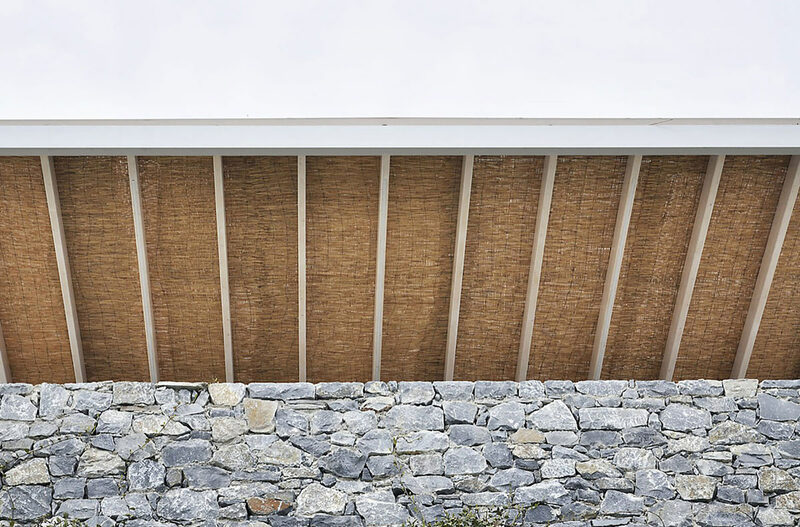 The staggering of the western wall from the outline of this volume creates a long and narrow circulation area under a flat parapet roof that connects all three volumes. 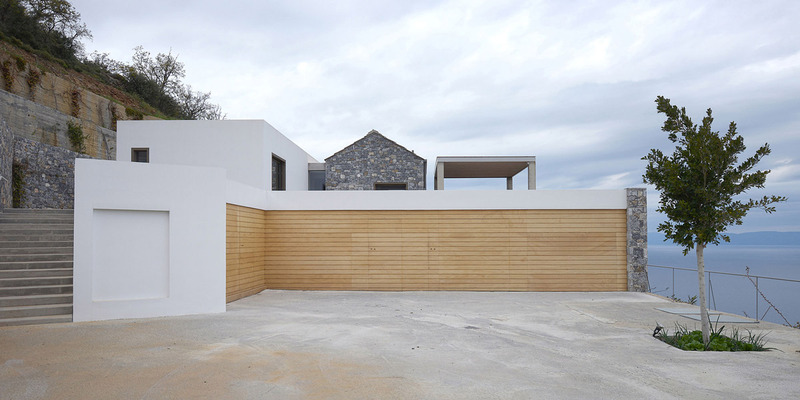 Two white blocks are set back on either side of the main volume (where the bedrooms and wc’s are hosted) acting as reference to the minimalism and sincerity of our attempted architectural language away from heavy decorative features and overstatements. At the intersection of the three volumes two fair faced concrete beams act as “connectors” subtly underlining the junction of the 3 blocks.